Surprise your loved one with a much-loved toy! Do you want to build bigger and better models? At BAYKO Shop, we can supply the BAYKO spare parts you need! We also sell BAYKO sets — all checked and complete. You’ll find all the extra bricks, bases, rods, floors, etc. necessary to achieve your structure. We offer extra bricks, windows, roofs, bases, floors, rods (of any length), and many other BAYKO parts. We have pre- and postwar sets and parts. Pre-war sets are very popular and are collectibles! BAYKO is a construction toy based on plastic and metal components. 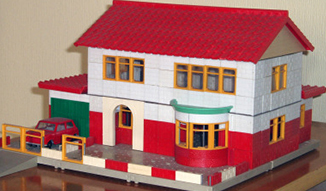 It can be used for building houses, churches and also railway buildings for train layouts. Originally intended as a child's toy, it now has a worldwide group of grownup enthusiasts. BAYKO was invented by Charles Plimpton, who wanted to pioneer the use of Bakelite plastic for the building of models. His system was based on positioning plastic bricks, windows, and doors between metal rods which had been inserted into rows of holes in a plastic base structure. Floors were inserted, based on paper/phenolic resin industrial laminate material. Plastic roofs completed the structures. Because of the colour limitations of Bakelite, the original pre-war BAYKO sets had parts that were brown and various shades of dark green, together with cream-coloured parts produced using aminoplastic thermosetting moulding compounds. Subsequent resin development by Bakelite Ltd. and also by British Industrial Plastics Ltd. provided moulding materials with paler colours, such as red, orange, and lighter green. Charles Plimpton is thought to have developed the concept of BAYKO after studying a Dutch system, Mobaco, which involved cardboard parts inserted between wooden vertical posts positioned into a cardboard base. Plimpton is also likely to have been influenced by the French system, Batiss, which had wooden parts supported by metal rods inserted into a compacted resin bonded paper composite base. It is interesting to note that the spacings between the rows of holes in the Batiss bases are similar to those in BAYKO bases, but the Batiss metal rods were of slightly greater diameter than BAYKO rods. Plimpton patented BAYKO in 1933 and rushed out his first construction sets for Christmas 1934. He called the toy BAYKO LIGHT CONSTRUCTIONAL SETS, the words "BAYKO LIGHT" being a pun on the word "Bakelite" which had been registered by the Belgian chemist Dr. Leo Hendrick Baekeland, who had invented Bakelite in 1907. The original BAYKO sets ranged from Set 1 to Set 5 with Converting Sets 1A, 2A, 3A, and 4A. 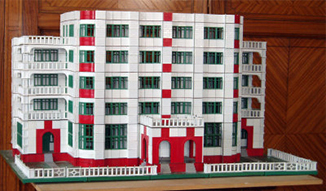 In 1935, a Set 6 was introduced, originally with mottled "oak" brown bricks and white windows and doors, and later in 1938, with red and white bricks and green windows and doors. A series of "Ornamental Additions Sets" A, B, and C was also introduced in 1935, to be followed in 1936 by Sets 20, 21, 22, and 23 which featured orange parts and curved parts. In later pre-war sets, the brown parts were replaced by red parts and Set 5A was introduced. In 1939, just before the Second World War, Plimpton replaced his original series of BAYKO sets with his "New Series" of Sets 1 to 6, with Converting Sets 1C, 2C, 3C, 4C, and 5C. 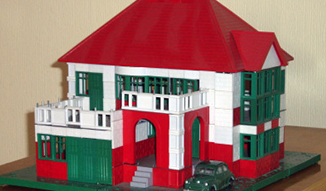 The New Series contained various modified parts, including smaller bases, and developed the use of curved bricks and curved windows which had been introduced in Sets 20 to 23. Production of BAYKO was halted during the war in 1942 but resumed in 1946. The postwar sets ranged initially from Set 0 to Set 2, with Converting Sets 0X and 1X. Sets 2X and 3 were introduced in 1947. In 1949 and 1950, some new parts were marketed and these were included in Sets 3X and 4, which were introduced in 1951. The new parts offered greater scope in designing the model buildings. This series of sets is referred to as "postwar Plimpton BAYKO" to distinguish it from the subsequently marketed "Meccano BAYKO." Charles Plimpton died in December 1948. During the postwar period, the models still tended to be based on designs from the 1930s and were gradually becoming somewhat dated. However, there were some modernisations in 1957 and 1958, such as the introduction of transparent glazing material and TV aerials. New technology was also introduced with the manufacture of some parts by injection moulding using the thermoplastic material polystyrene. An attempt at modernisation came in 1960, when Meccano purchased the Plimpton Engineering Co. business. Thermoset plastic parts were completely replaced by polystyrene, and this allowed lighter colours to be introduced such, as pale green, yellow, and bright red. However, following the Meccano takeover, the changes in manufacturing operations, the closure of Plimpton's factory, transfer of production to the Meccano factory, product re-design and re-tooling led to a shortage of BAYKO availability in the shops. This came at a time when LEGO was becoming more established. Meccano attempted to modernise the design of the model buildings, and they introduced much needed new parts. Unfortunately, there was only a limited amount of marketing and advertising support for BAYKO at that time. Meccano BAYKO was initially in Sets 11, 12, 13, and 14, which were the equivalent of Plimpton BAYKO Sets 0 to 4. The Meccano BAYKO Converting Sets were 11C, 12C, and 13C. All of these sets were launched in December 1960. Set 15 was introduced in 1962, corresponding to Plimpton BAYKO Set 4, and with Converting Set 14C being used to upgrade from Set 14. Sets 14C and 15 contained some interesting new parts such as dormer windows. However, it was all too late, and by 1963, competition from LEGO and AIRFIX building sets was becoming more intense. Instead of promoting BAYKO toys against LEGO, Meccano appears to have focused on developing Cliki — which was similar to LEGO but more complicated to build with. Advertising of BAYKO had been discontinued in 1963, and Cliki was launched in 1964. Production of BAYKO finally ended in 1967. The Cliki system was also discontinued having only lasted a few years. 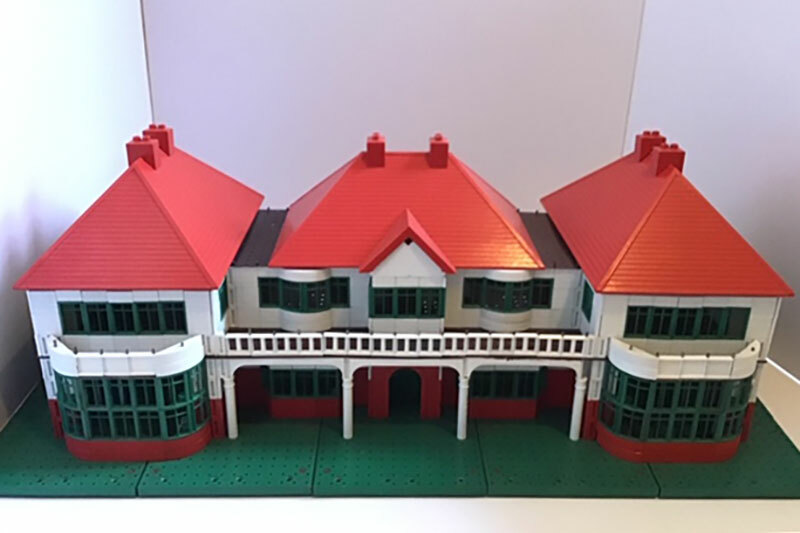 In May 2009, there was a BAYKO exhibition held in Merstham in Surrey to celebrate 75 years since Charles Plimpton developed his BAYKO Light Construction Sets. Exhibits included giant models of a 32-foot seaside pier, a 9-foot x 4-foot cathedral, models of Buckingham Palace and the Houses of Parliament and a skyscraper. There was also a comprehensive display of BAYKO boxed sets from the 1930s to the 1950s. The celebration of 80 years since Charles Plimpton first produced his BAYKO sets was held in the Liverpool Museum in June 2014, with an exhibition of BAYKO parts, sets, and models, some of which were spectacularly large. Interesting talks on the history were given by members of the BAYKO Collectors Club, who were very pleased to be hosts to the two daughters of Charles Plimpton when they visited the exhibition. More information about the history of BAYKO can be obtained from Bayko’s website. Our mission is to help and support BAYKO collectors throughout the world. See our complete price list for spare parts and more here.